Bed bugs have a flat, oval shaped body with no wings and grow to the size of an apple seed. They are a shiny reddish brown normally, but become swollen and dark brown after feeding. 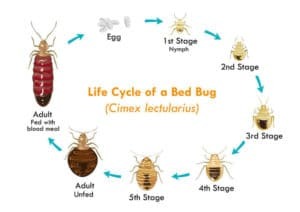 There is three stages in a bed bugs life cycle. In the egg stage, they look small and white like a tiny piece of rice. In the nymph stage, they are very tiny replicas of their full developed adult counterparts. Nymph take weeks or even months to fully develop depending on their environments temperature and the ability to feed properly. Bed bugs have five immature nymph life stages. They must molt six times before becoming fertile adults. They discard their outer exoskeleton, which is a clear empty exoskeletons of the bugs themselves. 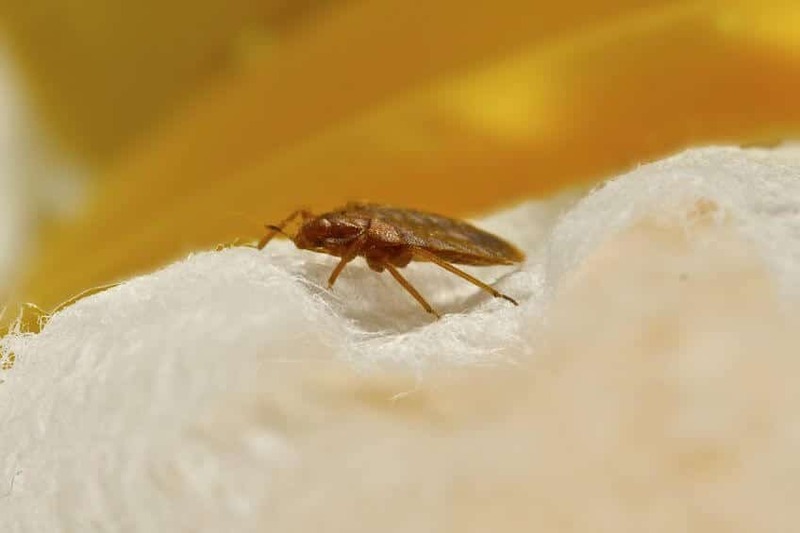 A fully developed bed bug is still only the size of an apple seed. WHEN WILL YOU SEE BED BUGS? Bed bugs come out at night to feed. How do they know where you are? Carbon dioxide, heat and the smell released by a human host are what attracts bed bugs to you while you sleep. This happens at night but will happen during the day when they are hungry. 10 minutes on a host to complete a meal and then it immediately returns to its hiding place. They defecate almost immediately after feeding. That leaves the characteristic black or brown spots on the bed sheets and mattresses. These symptoms reflect the best indicators that you have an infestation. A clear sign that an infestation is present is the odor. Like many species of bugs, bed bugs release odors called alarm pheromones. A group of bed bugs will create pheromones when disturbed. Higher concentrations of this pheromone create the unpleasant odor. The odor is similar to the odor stink bugs give off. Bed bugs are experts at hiding. During the day they hide in the seams of mattresses, box springs, bed frames, headboards, night stands, cracks or crevices, behind wallpaper, and under any clutter or objects around a bed. Their small flat bodies allow them to fit into the smallest of spaces and remain in place for long periods of time without a blood meal. They travel over 100 feet in one night, but typically live within 8 feet of where people sleep.